This picture had the following legend on the blog where I found it: "Korean territory. I've looked it up on the internet and it's true." The story of Hwan-guk is based on a pseudo-historical book written in the 20th century: the Hwandan Gogi (환단고기 http://en.wikipedia.org/wiki/Hwandan_Gogi) which relates the mythical origins of Korea. 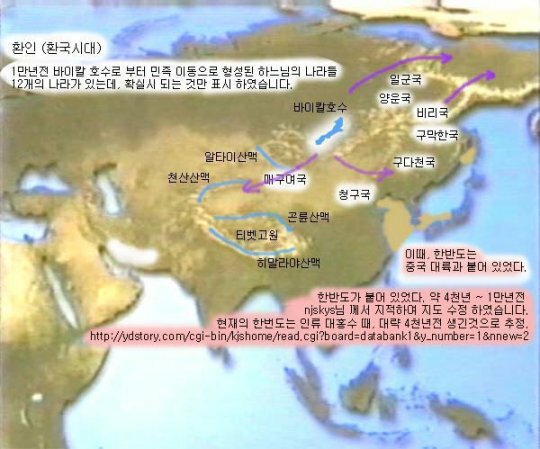 Hwan-guk was supposed to be a confederacy of 12 states, spanning 160 million square kilometers and lasting for over 3000 years. The theory is that the Korean race originated from Central Asia and conquered a territory which looks like the Mongol empire. The country was governed by Hwan-In. In the Samguk-Yusa, an old and widely studied historical record of Korea, Hwan-in was the grandfather of the mythical Joseon founder Dangun. Proponent of the Hwan-guk theory says that some versions of the Samguk-Yusa write Hwan-guk instead of Hwan-in (guk meaning country) and that this is the proof that the people who founded Korea descended from the old Hwan-guk empire. Here are some artistic depictions of Hwan-ins which I believe are taken from a popular book about the Hwan-guk theory. Notice the "Native American" look of several of them, this is because proponent of the Hwan-guk theory like to believe that America was originally populated by people who migrated from Korea. You'll learn for example that "There is a country called Sumiliguk. Some claim that Sumiliguk is the old Sumer civilization. According to this declaration, people of Sumer who has built up the Mesopotamia civilization are ethnic ancestors of Korea." This one had the following legend : "I did not get this map from a Korean book but from a History of ancient Asia written by a foreigner." This map shows how various places around the world were once Korean. One theory explains for example that the English Essex county is actually a deformation of Ui-San itself a deformation of Woo-San, the name of an old Korean kingdom. The people who believe in Hwanguk, or more generally in any form of Korean hegemony are sometimes referred to as 환빠 (Hwanbba) on history bulletin boards. Their detractors are 환까 (Hwankka). The theories about other places of the world, especially the Americas, having been conquered or populated by Koreans are many. Other theories based on "linguistic evidence" attempt to show links between Korea and the New World. offers more explanations such as the fact that Niagara would be a compound word based on the Korean words 나이 nai (넷 naet, four) +가람 galam (강 kang, river). These theories are wrong on so many levels I dare not even enter into too much detail. 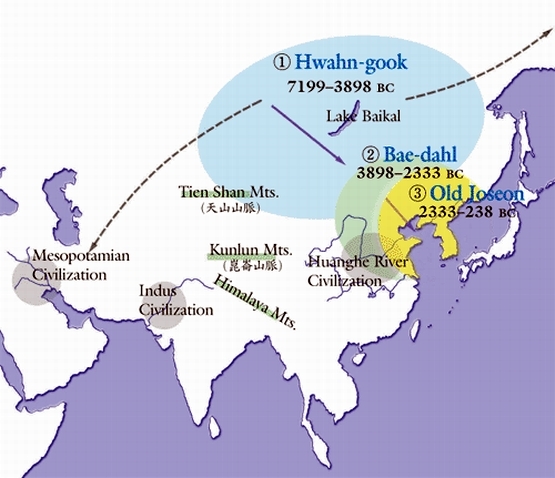 The first migration to the Americas, if it did indeed come from Central Asia occured much before the supposed time of Hwanguk, during the Late Glacial Maximum or even earlier according to the controversial, yet still interesting (and much more scientific) Solutrean Hypothesis. There is no evidence linking Korean to Sumerian and comparing words used in Korea in the 21st century to words from a language that went extinct more than 3000 years ago is pretty much against all linguistic common sense. But once again I guess this is not the point here. In one now forgotten work (Kina och Japan - China and Japan, only 350 exemplars were published in Stockholm by the Lagerstrom brothers in 1911), the famous Swedish playwright August Strindberg (en.wikipedia.org/wiki/August_Strindberg) once tried to prove that the name for Japan came from Jaffa in Palestine, that lama in tibetan came from imam in arabic, that some Chinese characters came from Greek letters, that the "king" of Peking came from the hebrew "chun" meaning city, which in turn became "kanan" in greek and "cingo" in latin. One French reviewer called Strindberg's work "childish" and "of no interest for sinology". His theories are still somehow strangely poetic, just like the Hwanguk theories are still interesting despite their lack of scientific value. Like Daily Korea Stuff On Facebook!